I love how around this time of the year we see more root vegetables appearing in the stores and markets. Rutabagas, carrots, sweet potatoes and parsnips are among my favorites. All of these can be cooked differently but roasting them produces a whole new flavor, and the oven does all of the work! If you just can’t decide on one kind of veggie, you could try this Maple Roasted recipe I made recently. As if the mixture of roasted veggies didn’t taste good enough, the maple syrup will really make you take notice. But this time I just wanted to focus on the parsnip. I don’t think it gets the recognition it deserves, but you should really try it. 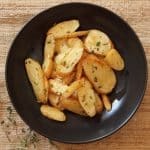 Roasted parsnips also make a really great replacement for mashed potatoes, just cook them the same way you would with the potatoes and load up with the butter, cream, salt and pepper at the end. 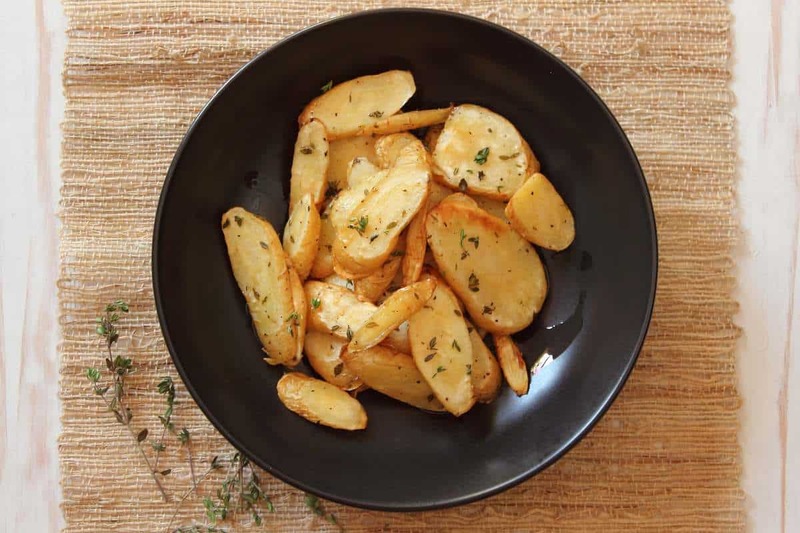 You can also steam, bake or slice them really thin and fry them to make parsnip chips. The parsnip is just like the carrot but tastes sweeter and can also be eaten raw. It’s ideal for giving flavor and body to stews, soups and casseroles. If you’re roasting a hunk of beef, throw in some sliced parsnips around the meat and the gravy will taste amazing. Thanks giving is in a little over three weeks and I challenge you to add parsnips to your menu. Even the price of parsnips are appealing, you should be able to pick up a pound of parsnips for a couple of dollars. A perfect side dish for any dinner. 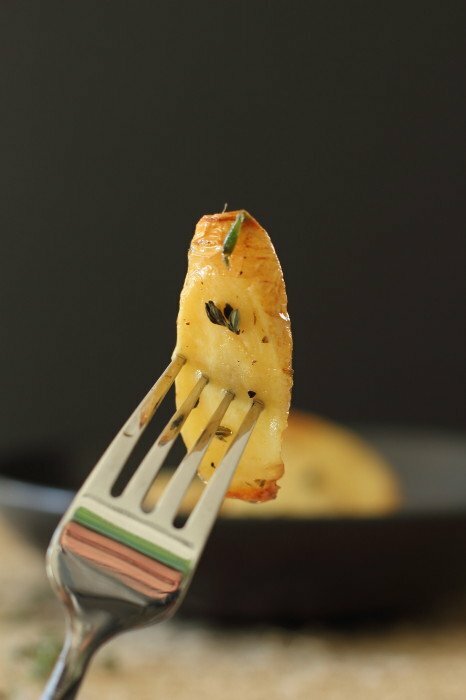 Slice the parsnips diagonally to about 1/4 inch thick and place them in a bowl. Add the olive oil, thyme, salt and pepper and toss well making sure the parsnips are well coated. Transfer to a baking sheet and place in the oven. Bake until they start to become golden brown around the edges and easily poked with a sharp knife. I love parsnips! These look perfect! Is the degree of baking stated correctly, “395” degrees??? That’s a new one for me!!! Thanks Barb, it should have read 375, changed now! I love roasted veggies, especially with thyme (my favorite herb!). Nice recipe. There is nothing else that grows around here in the cold months. I’m always excited to come across a simple idea like this one. Thanks. 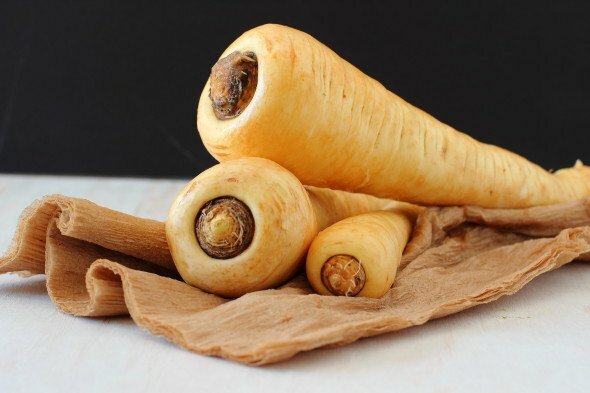 I just saw the freshest parsnips at the market and passed them by as they were not on my list of items to purchase. 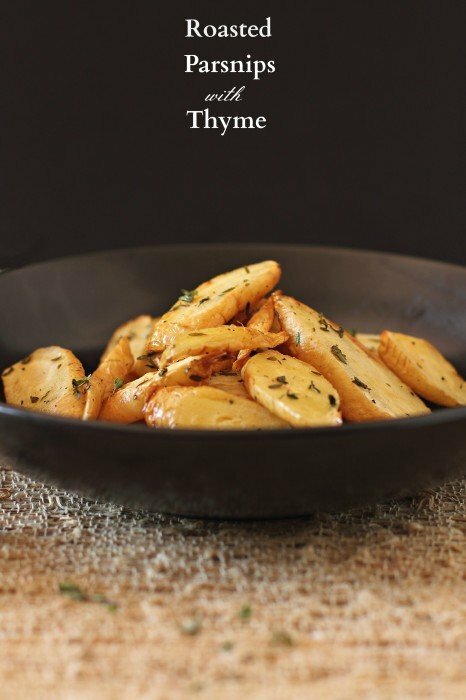 After seeing your scrumptious roasted parsnips I must plan a dinner to include this appealing autumn recipe! I’m almost embarrassed to say I’ve never cooked with parsnips – I’ve always put them in the same family as turnips which is the one vegetable that I have a childhood abhorrence of – but you’ve convinced me otherwise! Delicious! I had some parsnip soup for the lunch yesterday…gotta get more to make some roasted veggies. Soup, I never thought of that Angie! This really looks amazing! I can’t wait to try it! I love parsnips, but (foolishly) never roast them as a side! This is a must! That is about the biggest parsnip I’ve ever seen. The ones that we get around here are usually not much bigger than a finger in width. I adore roasted root vegetables – beautiful dish Gerry! Hi Gerry! I haven’t been to this blog before but love it! 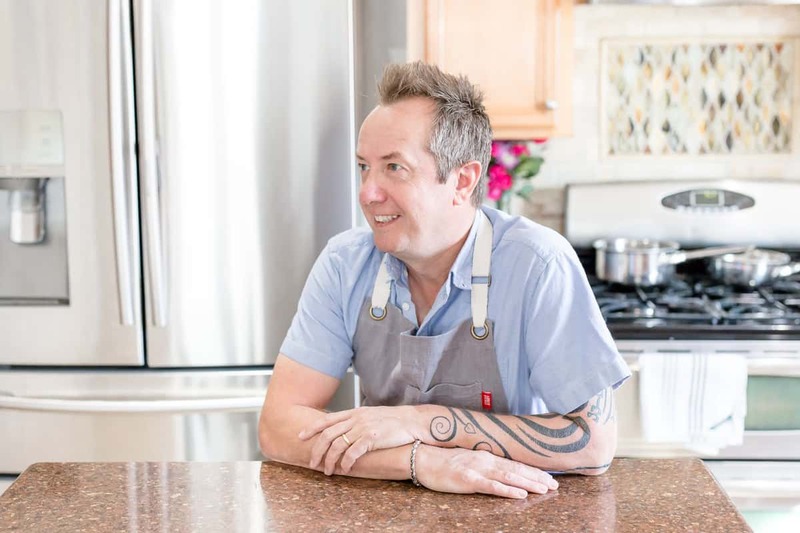 Your photography is beautiful and your recipes sound wonderful. I’ll be back! Welcome Whitney, glad you found me! GREG I like your idea better. Warm bacon vinaigrette…yup! So rarely do I see the recipes with parsnips. Your dish looks amazing: so simple and savory! Those look like the perfect Thanksgiving side dish! Thanks Christina, that sound perfect for brekkie!! Beautiful parsnips, lovely Fall harvest side! This vegetable is soo under-rated… looks good! You know, Gerry, I admit I’m not much of a parsnip lover, but you’ve made them look so full of flavor here, I think I’ll give them a go! Go for it Yas! You’ll love them.. I love parsnips! They so don’t get enough airplay. These would be perfect for any Holiday dinner. So good! I’ve made this multiple times. The sweetness of the parsnips really comes out when you roast them! Yum. Do you peel the parsnips or do you give them a good scrubbing instead? I’ve always peeled mine when making a parsnip/turnip mash. Hey Darrin, I always peel them as the skin can get kind of fibrous and tough.